Several weeks ago, the U.S. celebrated National Honeybee Day to bring awareness to the ongoing issue surrounding honeybees and their consistently declining numbers every year. 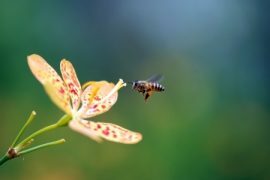 While the Department of Agriculture did release a report detailing a subtle increase in national honeybee populations – a potential positive side effect of the intense focus placed on bees and the enigmatic colony collapse disorder – there are those whose research indicates these numbers may not be as good as we think. As well, winter bee losses are still a problem, thanks to the growing presence of varroa mites and certain diseases. With all this to think about, there are still plenty of ways for regular folks to help out honeybees and other pollinators. Many individuals prefer keeping their gardens and flower beds orderly, but allowing wildflowers like clover and dandelions to grow can greatly help pollinators out, given the diversity and nutrition they offer. For those who want to take it even further, it’s also possible to dedicate a small part of your garden or yard to other hardy, inexpensive wildflowers. Once they’ve grown, wildflowers like thyme, lavender, mint, rosemary, and poppies create a rich bounty for honey bees and other pollinators. Admittedly, the sight of entire hive’s worth of bees flying around can be disconcerting, but should anyone ever come upon a bee swarm in a fairly precarious place, don’t call an exterminator – contact an experienced local beekeeper. This professional can remove the swarm without any trouble whatsoever. It’s also worth noting that bee swarms are not dangerous or aggressive—they are just half of a hive that grew too large, and they’re looking for a new place to call home. However, avoid spraying them with water or agitating them in a similar way because they will defend their hive if you do. Evidence continues to grow regarding pesticides that contain neonicotinoids as well as their harmful effects on honeybees and other pollinators. Recent studies have corroborated what controlled field tests and lab tests have been showing—bee behavior changes due to exposure to these pesticides, and prolonged exposure could significantly weaken beehives over time. With this in mind, people can choose to seek out products that don’t contain neonicotinoids or even opt for natural alternatives for guarding against pests. Many environmental organizations are calling for the Environmental Protection Agency (EPA) and similar authorities to restrict or even ban the manufacture or use of neonicotinoid pesticides and other potentially harmful pest control methods. These groups often cite alternative pest control options, such as crop rotation and barrier planting, as the safer approach. Given that Europe has already taken steps forward regarding neonicotinoid pesticide restriction, there are calls to do the same here. Regardless of where people stand, they should do their own research regarding the topic if they are seriously considering putting the work in to help out honeybees and other pollinators.